A story that melds traditional fantasy and space opera. The Astral Chronicle follows a group of explorers travelling a mysterious cosmic ocean known as the Astral. Within the Astral, many worlds exist, some modern, some medieval, some completely unlike anything seen in the real world. By sailing to the edge of one world, a ship can pass through the sky and into the Astral, and from there, reach new and uncharted worlds. The stories follow a crew aboard one such ship, led by a man known only as the Captain, as they explore new worlds and encounter undiscovered places. Updates Wednesdays. The Astral Chronicle has not been tagged yet. 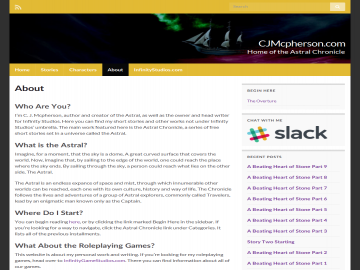 Help others find The Astral Chronicle by tagging it! The Astral Chronicle has not been reviewed yet. The Astral Chronicle has not been recommended yet.